McAfee Vulnerability Manager for Databases automatically discovers databases on your network, determines if the latest patches have been applied, and tests for common weaknesses such as weak passwords, default accounts, and other common threats. Vulnerability Manager for Databases conducts more than 4,700 vulnerability checks against leading database systems, including Oracle, SQL Server, DB2, and MySQL. Clear visibility into database vulnerabilities — By improving visibility into database vulnerabilities and providing expert recommendations for remediation, Vulnerability Manager for Databases reduces the likelihood of a damaging breach, and saves money through better preparation for audits and compliance with regulatory mandates. Risk evaluation from all known threat vectors — Unlike other products that overwhelm you with a myriad of minor threats hiding the critical issues that must be addressed, Vulnerability Manager for Databases evaluates risk from all known threat vectors and clearly classifies threats into distinct priority levels, provides fix scripts, and includes recommendations. Centralized database security management — McAfee Vulnerability Manager for Databases is fully integrated with McAfee ePolicy Orchestrator (McAfee ePO) software to provide end-to-end visibility, detailed alerts and reports, and a consolidated management platform for database and other protections. You store your most valuable and sensitive data in a database, but most vulnerability assessment products don’t know enough about database systems to thoroughly test them, putting your data at risk. Practically every week there’s yet another announcement of a major data breach. McAfee® Vulnerability Manager for Databases automatically discovers databases on your network; determines if the latest patches have been applied; and tests for common weaknesses, such as weak passwords, default accounts, and others, making it easier than ever to demonstrate regulatory compliance and better protect critical data. Conducting more than 4,700 vulnerability checks against leading database systems such as Oracle, Microsoft SQL Server, IBM DB2, and MySQL databases, McAfee Vulnerability Manager for Databases evaluates risk from virtually every threat vector. But, unlike other products where scan results can often overwhelm you with a myriad of minor threats hiding the critical issues that need to be addressed, McAfee Vulnerability Manager for Databases goes far beyond that. Based on input from database security experts, it clearly classifies threats into distinct priority levels and provides fix scripts as well as recommendations. Unparalleled visibility into database security posture. Scans multiple databases across the enterprise from a centralized console. Accelerates time to compliance and minimizes audit cycles, resulting in significant cost savings. Requires minimal knowledge of database systems. Generates customized reports in an easy-to-understand format for various user roles. Know exactly where risks are and how to minimize the likelihood of a breach by automatically discovering databases on the network, and conducting more than 4,700 checks for vulnerabilities. Get recommendations for remediation for the most high-priority vulnerabilities, in many cases augmented with fix scripts you can run to address any issues. Get comprehensive and up-to-date checks of the most popular database platforms reporting on meaningful criteria such as version/patch level, changed objects, modified privileges, and forensic traces from common hacker tools. Find databases by scanning the network or by importing from existing tools, and identify tables containing restricted information based on preset patterns. Use a variety of techniques to detect weak passwords and shared passwords, including hashed passwords (SHA-1, MD5, and DES), by downloading data for local analysis to avoid affecting database performance. View reports for PCI DSS and other regulations, as well as specific reports for various stakeholders such as database administrators (DBAs), developers, and InfoSec users. Organize items by priority and provide actionable recommendations for remediation based on input from leading security researchers. McAfee Vulnerability Manager for Databases is directly managed with the ePO platform, providing centralized reporting and summary information for thousands of databases from a single, consistent dashboard. With a set of features designed to speed initial scans and out-of-the-box reports to address most compliance requirements, McAfee Vulnerability Manager for Databases delivers audit-ready results with minimal resources. Automates discovery of databases on the network. Locates and identifies tables containing sensitive information. Conducts a quick port scan providing database version and patch status. Presents findings in preconfigured reports for various compliance standards. Compromised passwords are responsible for a significant percentage of data breaches and hackers have become much more automated in their attacks based on simply guessing passwords. Basic security principles include avoiding weak passwords and preventing sharing of passwords across users and accounts, but how do you know it’s happening? McAfee Vulnerability Manager for Databases offers the fastest weak password detection methods available, flagging accounts with simple passwords, default passwords, and shared passwords. It can even scan hashed passwords, stored, for example, in SHA-1, MD5, or DES. By using direct connections to databases, password checking is accomplished without significant load on the database server and does not lock out users for excessive login attempts. Identify susceptibility to database-specific risks, including SQL injection, buffer overflow, and malicious or insecure PL/SQL code. Prioritize findings and highlight the “real” issues needing immediate attention. Provide actionable intelligence on how to address risks, including fix scripts whenever possible. Allow security and compliance users with limited database knowledge to quickly understand risks to sensitive data and how to remediate them. McAfee Vulnerability Manager for Databases is fully integrated with the McAfee® ePolicy Orchestrator® dashboard, providing centralized reporting and summary information for all your databases from a consolidated dashboard. It delivers detailed information and scan configuration as well as direct links to invoke the vulnerability scanning management console with granular control over every operation. These are minimum system requirements only. Actual requirements will vary depending on the nature of your environment. 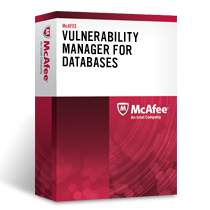 Download the McAfee Vulnerability Manager for Databases Datasheet (PDF). For more than 1,000 database instances, please use our Quote Request Form! WebSecurityWorks.com is a division of Virtual Graffiti Inc, an authorized Intel Security reseller.